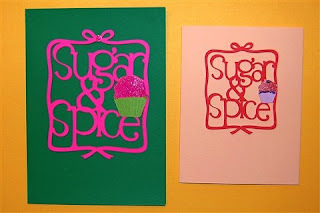 Capadia Designs: Sugar and Spice - in any size you want! Here, as promised, is the updated file for the Sugar and Spice design which I have recreated using the new technique for "grouping" that I explained in the tutorial I posted on August 21st. Here is a LINK to that tutorial and I will keep a link at the top of my blog to help those that are just getting started on this new method of welding which produces finished designs that can be copied, pasted, resized, rotated, flipped and manipulated in the same way the a single element could be in the prior version of the software. One IMPORTANT thing to note is that after you complete the design you should not use the "apply" button in the Shape Properties box after you enter new values in the x and y coordinates or in the height and width boxes. The "apply" button is only for kerning and if you hit it after entering new values in any of the top four boxes it will make all of the elements "jump apart" and you will have some difficulty getting the design back to where you started. For this reason, I would suggest saving a backup file with a few copies of any design you make so you can retrieve one if you somehow hit a control that takes your design apart! 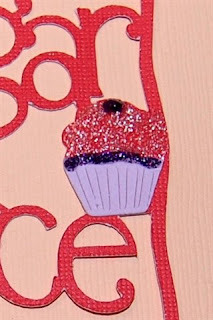 I decided that the cupcake needed a bit of bling so I added Stickles glitter glue for the frosting and cut an additional cupcake in the correct size so that I could cut off the "wrapper" portion (I first tried just adding pen lines as you can see below but I thought more contrast was needed to make the cupcake stand out! To cut the extra cupcake you need to first size the full design by using the handle in the lower right corner and then click somewhere else on the mat, select the cupcake from the celebrations cart and move it over the design, using the handle in the lower right again to size it exactly the same as the one in the welded design. 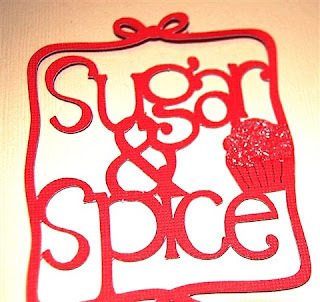 Select, copy and paste that single cupcake to a new blank page (and be sure to delete it from the page with the full design) then load a mat with paper, cut the cupcake and trim off the "wrapper" portion (just two small snips as there is a design cut at the wrapper level. I do wish that we had the option of keeping some of the detail lines when items are welded - perhaps in another update? My favorite thing about this technique is the ability to create a design the would work for a small card, a large card and a full page layout by designing once and then saving and copying and pasting to create a new size for your project. The cards in this photo are 5 x 7 on the left and A2 (4.25 x 5.5) on the right. This is such a time saver, however, I still hope for a true single click "select all" and "group/ungroup" feature to be added to the program. Thanks for the sugar and spice file and also for the tutorial.